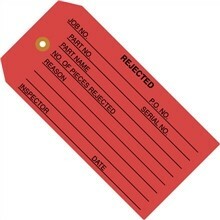 "Accepted" Inspection Tags, Blue, 4 3/4 x 2 3/8"
"Accepted" Inspection Tags, Green, 4 3/4 x 2 3/8"
"Rejected" Inspection Tags, Red, 4 3/4 x 2 3/8"
"Repairable or Rework" Inspection Tags, Green, 4 3/4 x 2 3/8"
"Inspected" Inspection Tags, Yellow, 4 3/4 x 2 3/8"
Pre-Wired "Inspected" Inspection Tags, Yellow, 4 3/4 x 2 3/8"
Pre-Wired "Accepted" Inspection Tags, Blue, 4 3/4 x 2 3/8"
Pre-Wired "Accepted" Inspection Tags, Green, 4 3/4 x 2 3/8"
Pre-Strung "Accepted" Inspection Tags, Blue, 4 3/4 x 2 3/8"
Pre-Strung "Accepted" Inspection Tags, Green, 4 3/4 x 2 3/8"
Pre-Wired "Rejected" Inspection Tags, Red, 4 3/4 x 2 3/8"
Pre-Wired "Repairable or Rework" Inspection Tags, Green, 4 3/4 x 2 3/8"
Equipment inspection tags make quality control operations a snap. 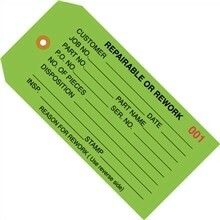 These tags are colour coded, making it easy to differentiate inventory or other products. 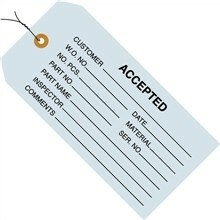 Information such as customer name, job number, number of pieces, and other critical inspection information can easily be written down, making it simple to not only categorize different products, but also to quickly find out information on the product and its inspection at a glance. 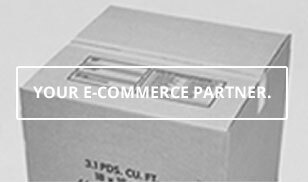 At the Packaging Company, it’s our goal to make business tasks easier. 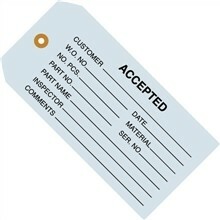 That’s why we stock a wide selection of inspection tags and other items that are critical for helping organizations succeed. At the same time, we know that as important as these products are, no business wants to spend a long time searching for them or a lot of money to purchase them. That’s where we come in. 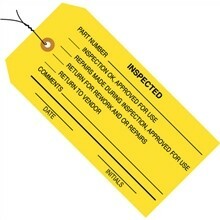 We’re a one-stop solution for equipment inspection tags and other important business tools. You can trust the Packaging Company. 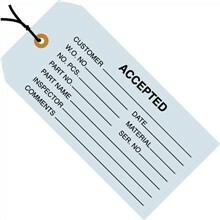 We work closely with our customers to help them find the products they need while also providing them with the customer service they deserve. While other companies may make it difficult to get in touch with them, we’re more than happy to talk to our customers via phone or email whenever you’d like. We’re here to help you. If you have any questions about our inspection tags or any of the products we sell, do not hesitate to contact us. 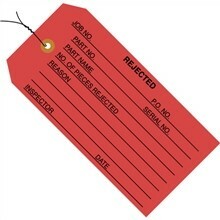 We often an extensive variety of different tags for a number of different purposes. 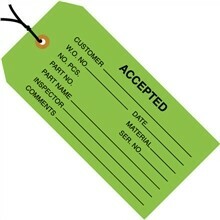 They are colour-coded so you can easily identify items as accepted, rejected, repairable, or inspected. 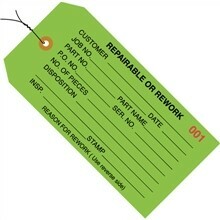 They are also available pre-wired for ease of use. 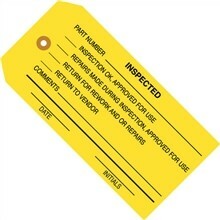 This product makes the inspection process easier, more straightforward, and significantly more organized. That’s what we do at the Packaging Company! We help you run your business more efficiently than ever before!